LENOX DALE, MASSACHUSETTS — When Tom Briggs clicks on the news and sees the scenes of foreign highways pock-marked from the blasts of improvised explosive devices targeted at the United States military, or of police and SWAT teams quelling potentially dangerous demonstrations in his own country, his grief is tempered compared to that of most people. That’s because the company he saved from obliteration seven years ago now stands at the very forefront of keeping the good guys safe, both at home and abroad. Patriot Armor, the manufacturer of bullet-proof, bullet-resistant, safety and architectural glass, has become the go-to source for the U.S. government as well as private businesses and individuals seeking security in an increasingly hazardous age. You see their product on armored tactical vehicles, in U.S. embassies, the White House, schools, banks, police riot shields, the face masks of NATO troops, and in the new expanded headquarters of Facebook, just to name a few applications. Indeed, last year, Patriot Armor invested $1 million to complete a 20,000-square-foot addition to its plant in the village of Lenox Dale, in the hills of western Massachusetts. 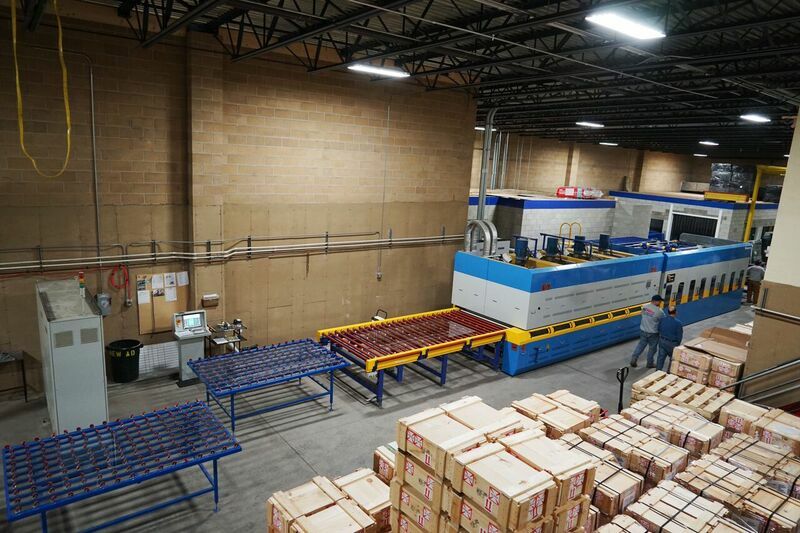 The addition, which increased the plant’s size by nearly a third, now houses its newest enterprise: a Yuntong tempering and bending furnace, which went on-line in December. The addition is all in keeping with the trajectory of Patriot Armor, whose sales have increased by 20 percent a year for the past six years. The company is also looking to increase its 50-employee workforce by 10 people this year. The plant runs six days a week. Despite the growth and cutting-edge advancements, Patriot Armor has managed to maintain a mom-and-pop work culture that has become legendary in these parts. It’s a culture that runs through the family, in fact. “We have some interesting clientele, to say the least” says Pete O’Brian, the purchasing agent. “Our glass is used inside of the Statue of Liberty. It’s down at the new World Trade Center tower. We’re in the White House guard booths. We recently made 24-inch-by-24-inch panes used in the big, heavy steel doors for a nuclear waste site out West. Though its products are ever-improving, the basic manufacturing process at Patriot Armor hasn’t changed much over the years. Every product they manufacture consists of three basic raw materials: glass (which they purchase from several vendors throughout the country), lexan and a bonding agent called urethane. Once the glass is cut to the necessary size, it is arranged sandwich-style with sheets of lexan and urethane to a thickness that depends on the given product line. For instance, Patriot Armor’s bullet resistance glass line will protect against an assault with a hand gun (.22 mm, .38 special, .357/.44 magnum) to an all-out attack with a 7.62 mm M-14 rifle. Its armored glass kits for military vehicles protect troops from threats such as IED fragments and AK-47 rounds. Giving a tour of the plant recently, as workers were firing up the new tempering oven whose giant fans reach jet engine-level decibels, Briggs was explaining the delicate balance involved in the tempering process. Yes, it’s all about tension. In a world filled with it, Patriot Armor is progressively putting more and more people at ease.